(CNN) -- A state fair's response to the uproar over a rodeo clown's mockery of President Obama is creating an uproar of its own. From now on, the Missouri State Fair won't allow any rodeo cowboys or clowns from the state's association to take part unless they all undergo "sensitivity training." And that's just part of the fallout from the Saturday incident in which a clown wearing an Obama mask held a broom descending from his backside while a voice said, "Hey, I know I'm a clown. He's just running around acting like one. Doesn't know he is one." Mark Ficken, president of the Missouri Rodeo Cowboy Association, has resigned. Rodeo clown Tuffy Gessling has apologized. He told Missouri news outlet digitalburg.com that he was the one whose voice was heard at the event, and that he never meant to offend. "It was a colleague of mine that was dressed up. I am the rodeo clown making jokes," he said. Gessling did not immediately return a message Thursday from CNN requesting comment. U.S. Rep. Steve Stockman, a Texas Republican known as a provocateur, has invited the clown -- whose name he did not yet know -- to come perform in his own district. "Liberals want to bronco bust dissent. But Texans value speech, even if its speech they don't agree with," Stockman said. After video of the event caught attention on YouTube, fair officials and politicians -- both Democrats and Republicans -- slammed the portrayal of the president. So did some attendees, such as Perry Bream, who said, "It wasn't clean; it wasn't fun. It was awful; it was sickening. It was racist." The Missouri State Fair Commission announced it was permanently banning "this rodeo clown from ever participating" again. It did not name the clown. That behavior, during the Missouri Rodeo Cowboy Association's Finals Rodeo, was "unacceptable," the commission said. Before it will consider contracting with the association again, "they must provide evidence to the director of the Missouri State Fair that they have proof that all officials and subcontractors of the MRCA have successfully participated in sensitivity training," the commission wrote in a news release. The conservative news outlet The Blaze called the demand "political insanity." A Facebook page supporting Gessling had more than 50,000 likes by Thursday morning. On Twitter, some people argued that being offended by a rodeo clown is "ridiculous." But others disagreed. "The sensitivity is needed by those fair planners who approved this act as representative of all Missourians," wrote Lisa Robinson. Missouri State Fair is requiring "sensitivity training" for rodeo clowns following Obama mockery incident. Thoughts? The Missouri Rodeo Cowboy Association issued a brief statement apologizing to those offended by any performances at the rodeo. The Missouri State Fair Commission and the Missouri Rodeo Cowboy Association did not immediately respond Thursday to CNN's requests for comment. Ficken, who stepped down Monday evening as president of the MRCA, has been threatened physically in the wake of the incident, CNN affiliate KDSK reported. He fears he may lose his job as superintendent of the Boonville R-1 School District, which is investigating whether he was involved. "He's shaking like a small dog passing razor blades," Ficken's lawyer, Albert Watkins, told the station. 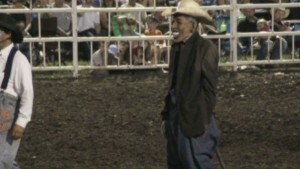 Ficken announced special guest "President Obama" at the rodeo. At one point, he said, "Watch out for that bull, Obama," but otherwise he was not part of the performance, according to Watkins. Gessling, meanwhile, told digitalburg.com he's been a rodeo clown throughout his career, and that it's what he loves to do. "Making fun of political and famous people is kind of the platform," he said. "... I've never tried to dishonor or disrespect anyone, so the whole thing was not meant to be racist or disrespectful. I was just trying to make people laugh."